Plaid is a classic pattern and very versatile as well as gender neutral. It can be made masculine of feminine simply based on the color choices. We have chosen to do our design in blue and brown, which makes it masculine. However, as with many of our patterns, you can choose your own colors, so simply by changing the blue to pink - you how have a feminine plaid! 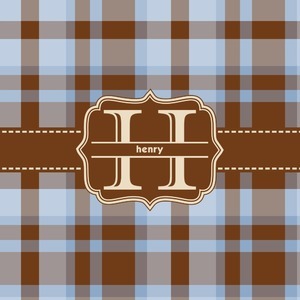 We choose a matching brown decorative label, trimmed in tan, will showcase the initial of your choice and your name. Whether you choose to personalize it not, the choice is always yours - and if you do chose to personalize it, you of course have many choices of ribbon and label styles, as well as personalization styles. So go ahead and design one to suite you very own personal style.